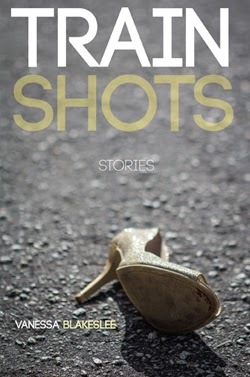 Vanessa Blakeslee is the author of the new short story collection Train Shots. Her work has appeared in a variety of publications, including The Paris Review Daily and The Southern Review. She lives in Maitland, Florida. Q: How do you come up with the ideas for your stories? A: For the most part, my fiction arises very much from setting. I’m not so much an image-driven writer; often I find myself fascinated by hearing anecdotes of people stuck in unusual circumstances, and my stories arise out of exploring those predicaments. Setting very much drives a story such as “Welcome, Lost Dogs” or “Don’t Forget the Beignets.” In “Princess of Pop” setting looms so large, it functions almost as another character: the pop star is falling apart, she chooses to hole up in the hotel where Joplin died, and the story pretty much remains there. In others, where the setting takes more of a backseat to the conflict—“Ask Jesus” comes to mind, as well as “The Lung” and even “Hospice of the Au Pair”—I crafted the setting to create a certain desired effect. For instance, “The Lung” could have taken place anywhere. But since it’s a story about smoking, disease and the impermanence of nature, I set it in Florida during a summer of raging wildfires. Likewise, I chose for the protagonist to work in the field of environmental protection and have a green thumb. In that case, changing the backdrop to Costa Rica injected the story—if you don’t mind the pun—with just the unusual details to make it truly fresh and somehow more believable in its peculiarity. In terms of other work, my novel that’s set in Colombia could only take place there. The political backdrop and historical events preclude the conflict from taking place in another place and time. Q: Why did you select Train Shots as the title for the collection? A: “Train Shots” is one of my most memorable and usual stories, so we knew we’d include that one from the beginning; the tone and theme made it a ready contender for final spot, and usually the placement of the title story bears weight, so that made sense—Train Shots. But also there’s a double-meaning to the phrase “train shots.” In one sense, the collection is a journey, the reader peering in on different characters in various settings, glimpsing a “shot” of these individuals’ lives before the train zooms on. Then in the title story itself, P.T. eats dinner at a dive-bar alongside the tracks in Winter Park, where the bartenders offer “train shot” drink specials when the trains go by. Q: Do you know how your stories will end before you begin writing, or do you sometimes change the plot as you're working on the story? A: I find that I change the original endings about 50 percent of the time. Endings are so important because the image, phrase, or action you’re leaving the reader with casts back over the entire story; unity, coherence and resonance all depend on that final chord. I really strive on that first pass to nail it like a gymnast, and when an ending arises naturally the way titles sometimes do, that’s really nice. “Clock In,” “Welcome, Lost Dogs,” “Princess of Pop,” “Barbeque Rabbit,” “Uninvited Guests,” and “The Lung” all contain their original endings. But endings have also got to possess a certain lyrical quality; you want the final note of your story to sing. So you’ve got to tinker there to get the words right, as Hemingway famously said. Sometimes the action falls a little short; writing a first draft can be so exhilarating and exhausting, I think we have the tendency to sense the ending on the horizon and rush to meet it, or shoot past it. Whereas “Train Shots” had a whole extra scene that carried the story on a few beats too long; again, an example of overshooting your mark. In the editorial phase, we simply cut that scene while preserving the lyrical note. Q: Which authors have particularly inspired you? A: For short stories, my go-to authors include Poe, Chekhov, Hemingway and Sherwood Anderson, Alice Munro and O’Connor, to name a few. For novels, Tolstoy and Atwood. For craft, John Gardner’s The Art of Fiction and Doug Glover’s Attack of the Copula Spiders I find myself returning to again and again. I harbor a geeky desire to complete all the exercises at the back of the Gardner book. International writers often inspire me to approach language and form in new and surprising ways. Irish writer Kevin Barry’s novel City of Bohane, which won the IMPAC award, completely blew my mind in its mastery of lyricism, suspenseful storytelling, and fresh, compelling characters; also delightful and engaging was Lovestar by Iceland’s Andri Snaer Magnason, for different reasons. Recently I read The Ninth by Hungarian novelist Ferenc Barnas, which reminded me how the European writers conceive and approach the long form in astoundingly different ways than we do. A: For the past several months I’ve been revising stories for the second collection that I mentioned, and plan to draft several new ones. In between I’ve been working on essays, book reviews and yes, the occasional poem. Lately I’ve been drawn to speculative and dystopian fiction, and hope to write a futuristic novel—although not until the book promo for Train Shots dies down, because the new novel project requires research and a trip or two. My agent is currently shopping my first novel, so with luck that will get picked up soon. A: My interest in the dark side has lured me to Poe and speculative fiction, rather than the gritty social realism, quirkiness and black humor that runs through Train Shots. I expect my next collection to be quite different. Not fantastical in the vein of Karen Russell, per se, but more imaginative and strange in the tradition of the tale.